"Compact yet comprehensive, Rethinking the Black Freedom Movement does a masterful job of distilling the best and most recent scholarship on civil rights and Black Power into easily digestible nuggets. This is the new starting point for studying the movement." 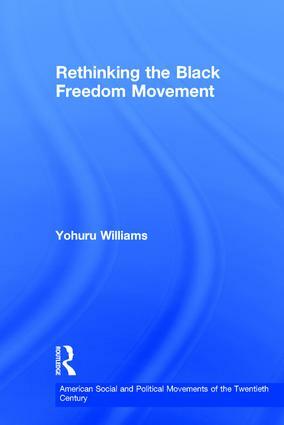 "Part breezy narrative, part comprehensive historiography, Yohuru Wiliam’s Rethinking the Black Freedom Movement is a brilliant and much needed synthesis of the rich new bodies of scholarship that have redefined our understanding of the civil rights and black power movements." "This splendid, succinct volume summarizes and interprets the African American struggle against oppression—the “Six Degrees of Segregation” in housing, education, voting, employment, criminal processes, and access to public spaces and conveyances… Specialists will value Williams’s insights and novices his clear writing as he weaves together the various expressions of the struggle into a coherent narrative. Summing Up: Essential. All levels/libraries." Yohuru Williams is Professor of History and Dean of the College of Arts and Sciences at Fairfield University.